Are you faced with leftover mashed potatoes and you really don’t wish to keep serving reheated potatoes? Yes, us too, but it’s not a problem, in fact, it can be a windfall with these Mashed Potato Patties. We do have a delicious solution for you today, Mashed Potato Patties. 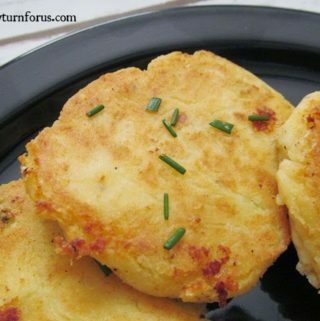 The leftover mashed potato patties that my mom are a great side dish and craved at our house. When making mashed potatoes,”experts”, say one potato for every two people. But I always count at least one potato per person with an extra two to three. No wonder we are faced with mounds and mounds of leftover mashed potatoes. Mashed potatoes are OK served again but how many times can you get away with re-heating the same old spuds? You don’t have to worry if you have a couple of recipes up your sleeve to deal with leftover potatoes. Especially this recipe for Potato patties, it will make you glad you have plenty of leftover mashed potatoes. And you might start even planning on having extra by making more in the first place. If you initially made chunky potatoes or our Crazy Good Rustic Mashed Potatoes you will need to mash the potatoes a little more prior to mixing up this recipe. The easiest way to do this is to use a potato ricer, it’s not that expensive and it can really save you in time and effort. Just a note, this Fried Potato Patties recipe is simply divine made from our Garlic Mashed Potato Casserole, you just have to try them! But I must confess, I may will be making extra potatoes just to guarantee leftover potatoes, all because my family loves to eat these golden Potato Patties. Maybe this is why I don’t often listen to “experts” and I cook the way I cook. Leftover Mashed potatoes seasoned and crispy fried. oh those look yummy!! i love all things potato! pinned these. I've never made these but I bet my boys would like them a lot! A must try next time I have extra potatoes!! Thank you for the recipe! Yummy! I'm hoping for lots of left over potatoes Thurs. and if not I'll just make some. I love potatoes. Pinning. Yummy, I love these. Will give these a try! These look delicious and perfect for those leftover potatoes! My husband would LOVE me to make these! What a good idea! We always have tons of leftover mashed potatoes, and these would be delicious! mmm I love this idea! cant wait to try them! Yes please! I love potato patties. I make some with sweet potatoes that I just love. What a great idea! I've never heard of them before but we'll have to try them! These look great! My mom used to make potato pancakes for dinner and serve them with apple sauce and sour cream. So yummy! I can't wait to try yours. What a great idea! I always have leftover potatoes. Next time, I doing this! I love potato cakes! In fact I love anything made of potato! Wow, those look delicious! The perfect shade of golden. Mouthwatering and now know how to use left over potatoes, besides bubble and squeak. Have made potato cake or pancake with raw potato which is popular. These patties are great for picnics also.